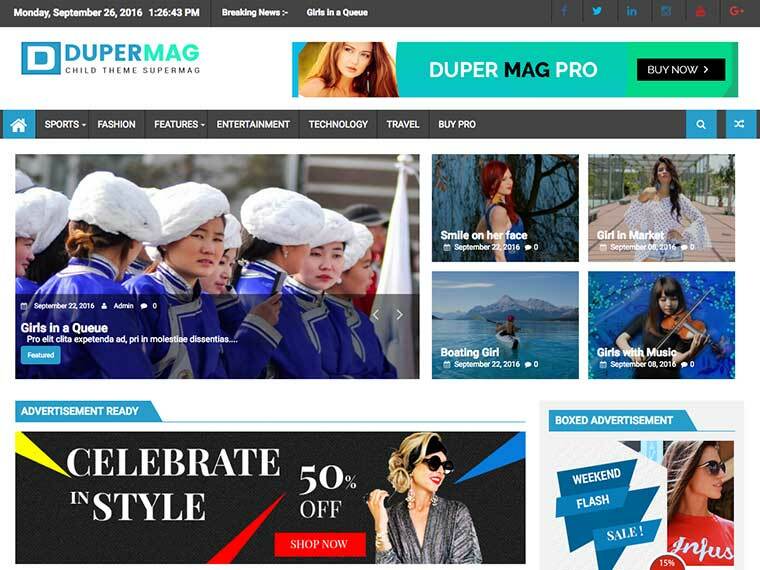 DuperMagPro is specially designed for news, magazine and blog, suitable for any magazine style site. 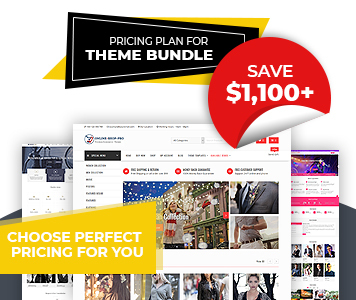 DuperMagPro is also advertisement ready theme. Advertisement can be added from customizer and widgets. It is highly crafted theme, with quality code and elegant design. Due to the added premium features, it helps to make your site awesome. DuperMagPro is highly customizable theme based on customizer and widgets. You can customize header, footer, sidebar, main homepage and inner sections. You can change the every section color and fonts with infinite color options and fonts options respectively. Its unique feature includes: drag/drop/reorder widgetized area, advanced custom widgets, advanced layout options, breaking news options, featured images options for blog/category/archive pages and single page/post, social media integration, advertisement ready, breadcrumb and more. You can easily set the sidebars on individual pages and post. Single post featured image options, Video post in place of featured image, single page meta options help to customize the theme easily. Translation ready, SEO friendly, Browser Compatible, Responsive and Woo-Commerce ready theme will give you the incredible experience in the world of web. DuperMagPro comes with advanced custom widgets for posts and advertisement management. The theme have 12 different custom sidebars areas for managing/designing the contents. Easily make your menu a mega menu. No additional plugin needed. Set a image and color for displaying before the site open. You can enable or disable it. You can change the layout of button used on theme. Use as your need. Select a default sidebar for layout. You can change the every page sidebar layout different. Design your blog archive layout as your need. Lots of options available for managing this section. More than hundred font family used on this theme. Change everything as your required font family. Lots of options available for managing comment section. Advanced navigation options with image and title also. Show or Hide author info on single page. With two level footer sidebars and available widgets you can customize what to display in footer footer section. Boxed-Full layout, Sidebar options with left, right, both, no sidebar, also feature image display options in blog and archive pages. Basic Color options, Advanced Color options and Category Color options are available for changing color of everyfield as your need. You can add or change any background image with different advanced options in your site. In a single post you can enable-disable related post through single post options with various options. Through the theme options you can enable/disable to show breadcrumb in the site. Simple, Advanced breadcrumb are available. You can add advertisement in many sections using theme options and advertisement widget. Place Image or Adsense anywhere in the site. Added very popular social media to link your profile from the site. Enable-disable date/time display in the header. Enable-disable breaking news display in the header. Lots of options are available for controlling breaking news. Reset all your theme setting to default or you can only reset color and fonts options. You can make the sidebar sticky. If not required, you can easily remove it also.